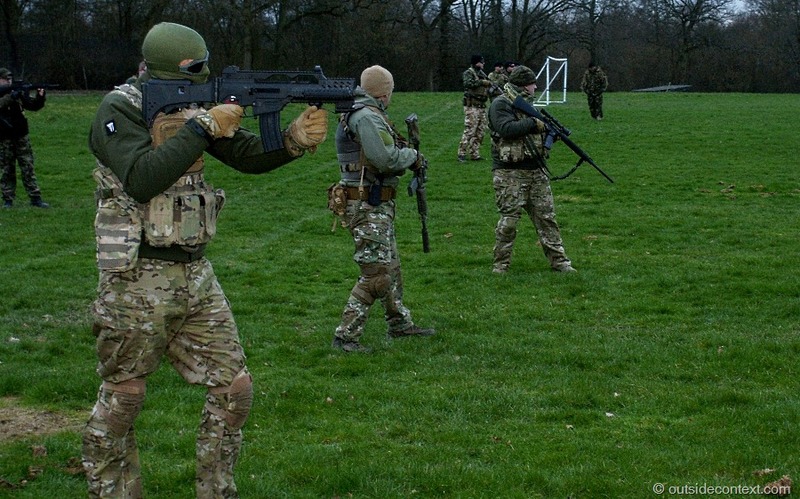 It is often said that Airsoft is a game of extreme variety. At one end of the spectrum there are the speedball players who only play in small arenas. For they the game is about CQC accuracy, high rates of fire and aggression. Tactics tend to be personal and if they play as a team at all it is usually in very small groups. There is hardly what could be called commanders. 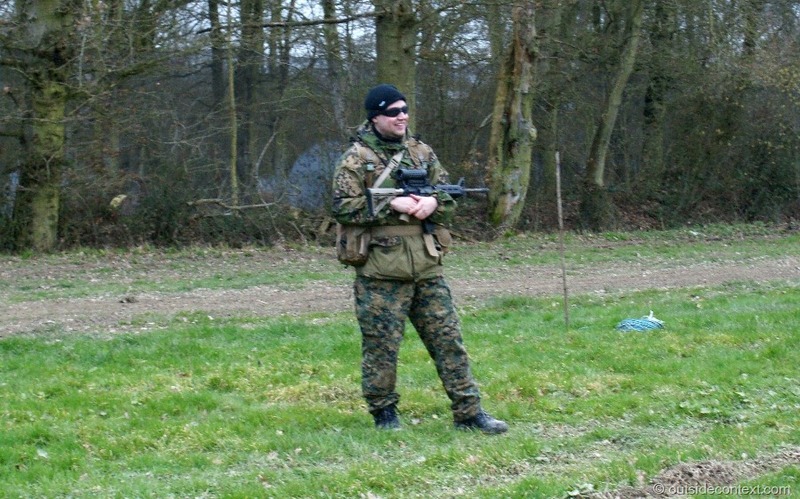 This was the airsoft of Electrowerkz. Veterans of that site tend to be tough, able to run into massive volumes of fire without flinching and a little unhinged. 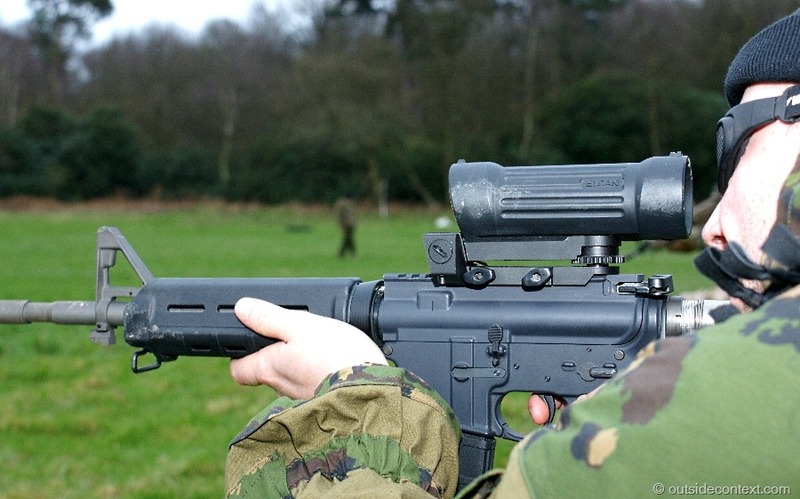 All the way at the other end of the spectrum is the sort of military simulation that companies such as Stirling offer in the form of training missions, hiking into countryside for 2 days for a 10 minute fire fight and being tortured when captured. It is into this enormous dichotomy that Tier 1 Military Simulations has launched their services pitched at both parties. 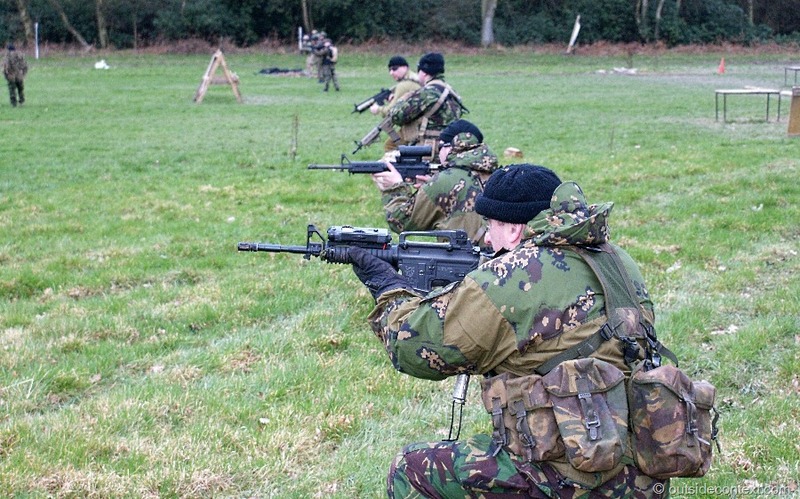 Staffed almost entirely by Ex-Royal Marine Commandos, Tier 1 Military Simulations has taken the mission to bring the fun back into milsim while keeping the “experience”. Their first 3-day event, “Operation Snakebite”, is coming in April, attendance at which my team mates have talked me into. I am not a natural milsim player, being more of an urban and CQB regular at such sites as The Mall in Reading and Longmoor Urban Training Complex, but recently I have been trying my hand at a little realism. Last year my team and I played as the “scripted enemy” in Operation Zulu by TA Events, which involved getting “very muddy” with the best of them and I enjoyed that immensely. 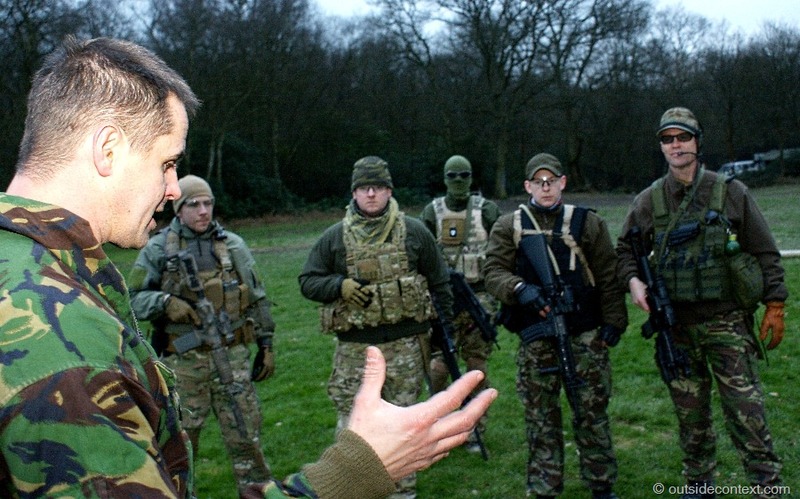 So, when I found out that Tier 1 Military Simulations was putting on a “Training Day” at Elite Action Games in Dorking, I signed up as it offered me the chance to “ease into it”. We arrived early on Saturday to meet with the Tier 1 crew; a four man team of instructors led by the smart looking and straight backed Stewart and his business partner Eddie. After dropping my bergen (holding all my camping gear and packed for the field with rations, a bivi and my roll mat) we were invited into a small hut. 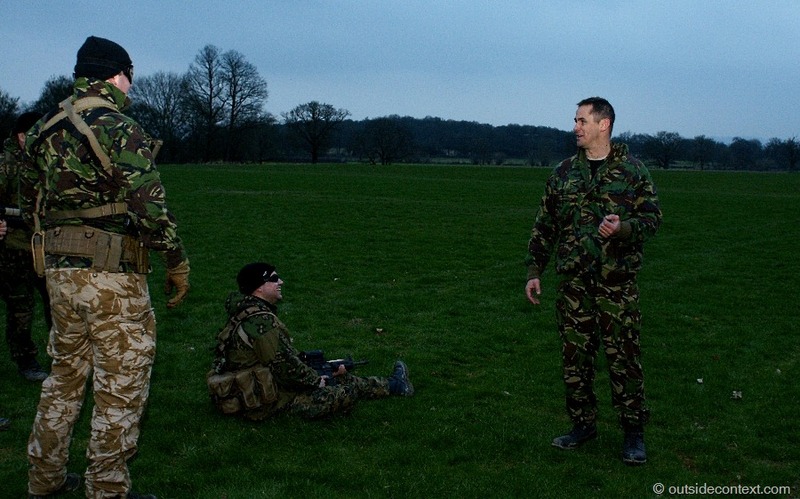 It was then that I realised that Tier 1 were not your normal airsoft instructors. In the hut were five tables all laid out with pencils, print outs and paper pads. As we sat down I also noticed that there was a large plasma flat screen to the front displaying what surely must be a PowerPoint screen. Stewart came in with the others and introduced themselves. In an airsoft world where many people have “served” in one form or another, but more importantly where there are a ton of fakers and exaggerators who claim undue respect through fictional exploits; 1000 yard stares and “issue” gear, these guys stood up and told us where they had served. The entire group had over 50 years’ service in the Royal Marine Commandos between them including decades as instructors. If there is such a thing as getting the “real deal” in airsoft, this is it. Once the lesson started, and the PowerPoint started moving, I relaxed. Stewart was clearly a professional at teaching. I detected that this was no ego trip for these guys and they had the serious aim of teaching us real Marine tactics straight out of the manual. 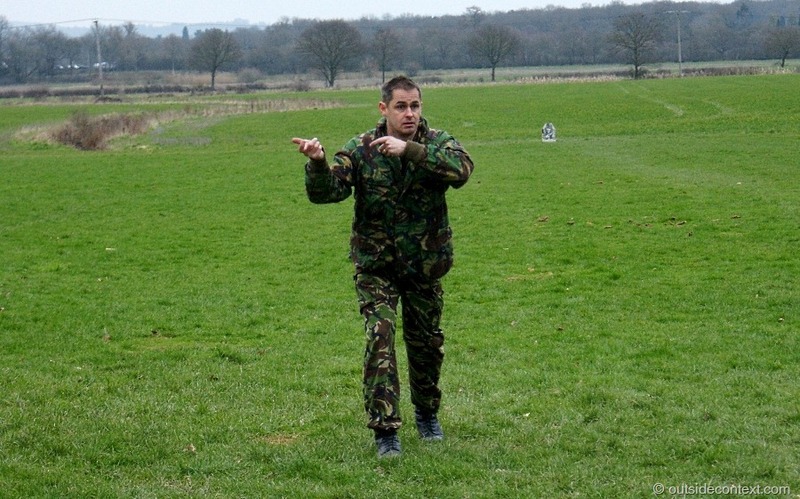 He had a well laid out day planned with short classroom sessions to discuss the tactics and answer any questions, split by practical tuition in the woods and finally culminating in performing the drills learned under fire at night in a test to see if we have picked any of it up. Despite being extremely tired from London commuting, I found it all clear and well presented. The lesson started and I took notes. We learned that Operation Snakebite would be “Patrol Warfare” with orders given to platoons to patrol between GPS coordinates with certain orders when contacting the enemy (who have been given orders to patrol a dissecting path) and it would be in this way that they would introduce some form of control to the event that will be otherwise unscripted. But first, we needed to learn what different types of patrol there were. Soon we were out in the field putting the lessons to good use in three groups. Our first jaunt was patrolling with Bergans in a line formation with the Team Leader at the front. We practiced halting and finding cover, crossing obstacles, how to reccy a village and the use of silent signals to communicate. All led by our short and stoic instructor who very quickly corrected mistakes and offered advice. I asked him what he had done in the Commando’s. He replied that had been a sniper mainly and had never played airsoft or even been shot by an AEG. We immediately offered to rectify that, but he declined with a smile, reminding us that the night event will include “live” fire. I could immediately tell that this night event was going to involved my being shot at by an ex-Commando sniper! At the end of this patrol we met up with the others and were taught how to lay up a harbour. Harbours are how Commandos form a defensive position in the field. This can be for many reasons, but the most obvious is to be able to sleep. We were shown how to peel into a triangle of one group per side with a command element in the middle with support weapons at the points. Then how to recy the area in front and lay out sentries and communication string. This was particularly interesting stuff as I have never heard of harbours before and it was all explained expertly and made perfect sense. After a late-lunch of hotdogs we went into a lesson of laying up an Observation Post, something the instructors were all experts in. After taking copious notes we were invited outside to see one for real. Stewart gave us a 30 meter area of trees and asked us to spot the OP. I must admit that I couldn’t see any possibility that people were hiding in that area but, after being led around the rear of the copse, I saw that the other three ex-Commandos were layed up in a smart OP mere yards from where my feet had been. It had a guarded entrance, sleeping/cooking area and front Observation Post all draped in cammo netting. Very impressive and something I would need to know when on ops. After this we went for a lesson in defensive contact drills. This was more familiar territory, but I still learned a lot of new things. We were taught how to form a tunnel formation on a “contact front” and then peel back while firing, how to form a “gatepost” leading to a “baseline” formation and then retreat by sections. How to manage a man down while providing fire support to the men dragging the casualty from the field. This was all practical and useful stuff that enabled my small team to learn to work together and put down impressive levels of fire onto the enemy. As the sun dipped down and the night fell the already cold day became freezing and the test was upon us. We had to patrol in the pitch-black night through the wood, following chemical lights tied to trees at 50 meter intervals. We were going to come under fire along the way and we had to react with the drills we had just learned, all under the watchful eye of Stewart who was wearing high end night optics. I wish I had been, as in my mesh mask I couldn’t see hardly a thing. I could just make out the man in front and would be performing the drills basically with my eyes closed. As we picked our way through the wood we suddenly had fire from the left. I spun left and went down on one knee and started laying down aggressive and large amounts of fire towards the sound of an AEG firing at me. I had loaded my P-Mags as “Real Caps” and so I was soon performing a mag change (many long hours of practicing in front of the Magpul DVDs paying off). It was then it all went to pieces. After a minute of everyone running in different directions, shooting each other and bumping into trees, Stewart called a halt and brought us in. He then took us through the contact and our reaction. It was very impressive, even with the NVG, that he had a total grasp of what happened. He gently led us through it and promised that the other teams had also messed up the first one; we would get better he told us. It was a bit embarrassing for us and Trip in particular took it all to heart as we were a team of very experienced players and used to being together. 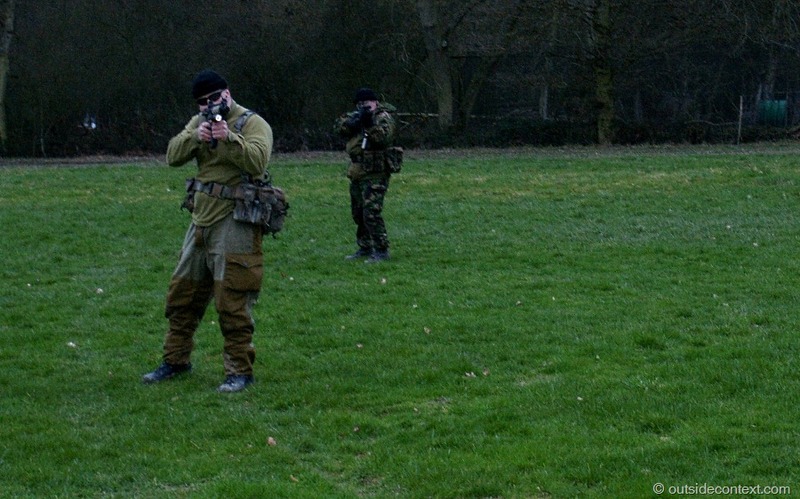 Only two months ago we executed a perfect peel drill to an aggressive contact when playing at Stirling Airsoft. That had left jaws on the floor, but that had been during the day; this was at night. I was suddenly reminded that Operation Snakebite was to be a three-day event and night ops was to be expected. We were determined to get better and I am glad to say that we did. Of course the chaos of the contacts, which came from all directions along our route, lent a realistic element to the training that practice can never give. I ran out of ammo and had to transition mid fight, Trip ran into a load of wire hanging from a tree and had to cut himself free (winning our argument about knives in milsim in the process), guns went down, men tripped up. It was marvellous chaos and pressure like all good training should be. By the end we were doing it very well and Stewart announced that our last contact was “75 to 80%” of perfect. That was good enough for me. After the event we dropped off our gear, ready to camp overnight, and went to the pub with the Instructors. They were very interesting and good company as we drank like only airsofters and Commandos know how. I asked our team what they thought of the event. Trip has been in airsoft as long as I and is leading the DA Team’s transition to playing more milsim. He and Keith (who has passed Stirling Selection) loved it and are looking forwards to our special role in the event. “How about you Simon?” I asked our other team member, a stocky Ex-Paratrooper. “How many jumps did you do?” Asked Trip. I laughed so much I spat out my beer on the table. I had to agree, Tier 1 don’t teach watered down airsoft versions of real tactics, it is all the real deal. 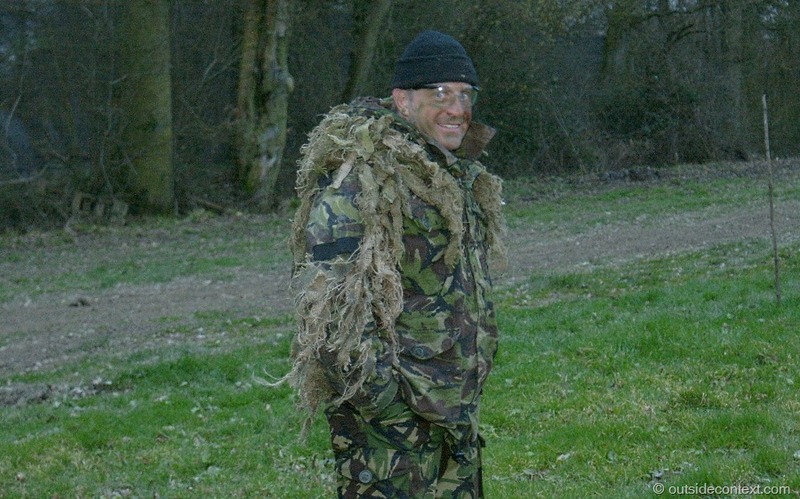 The philosophy is that if we learn the real Commando way of doing things then we will naturally perform better under fire in airsoft. It’s a great idea. Most teams are little more than a barbarian horde in combat or, like myself, unused to woodland. This training has enabled me to react like an element in a larger team. As far as I am concerned the argument about the value of training is dead; if the training is of the quality of that provided by Tier 1 it is worth every penny paid and every effort put in. 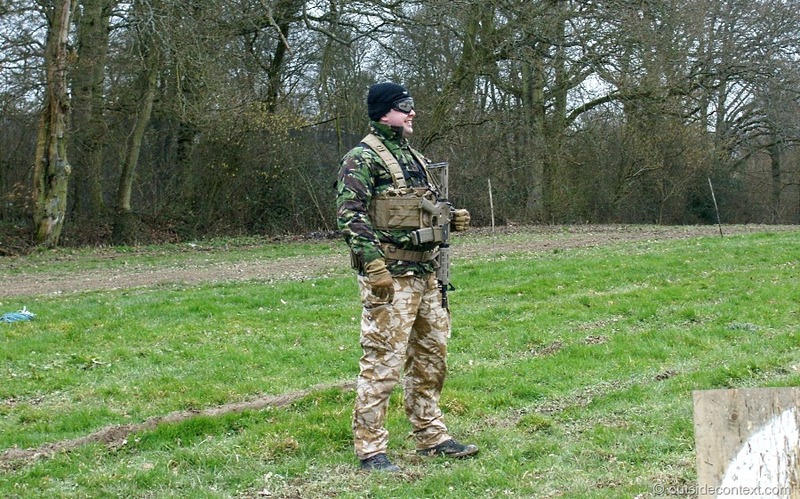 Basho and the DAs went to the Tier 1 Military Simulations Woodland Training day at Elite Action Games in Dorking. They paid £50 for a full day of training with food and drink provided as well as overnight camping at the event. 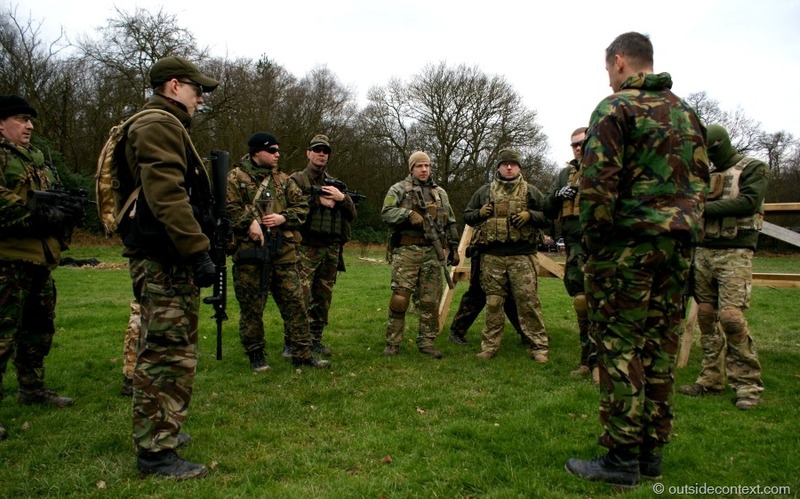 This was training given in advance of Tier 1 Military Simulations’ first game coming in April. Basho (the author) has been playing airsoft for 10 years. He is a committee member of Team Delta Alpha (the DAs) and was the senior marshal at their (now closed) home site of Electrowerkz in London. Basho in no way affiliated with Tier 1 Military Simulations, but Trip is as an airsoft consultant.